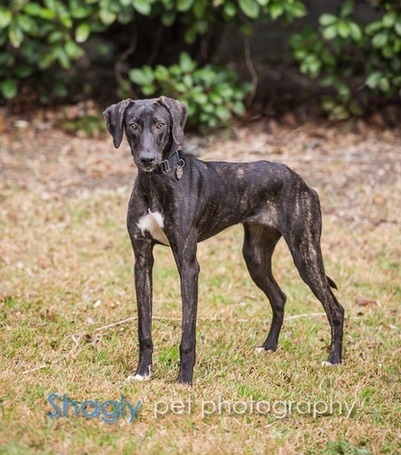 Polly is a young black brindle female who was found as a stray in Anadarko, OK. She is estimated to be about 1½ years old. Polly is a little bitty girl - weighing in around 30 pounds right now. 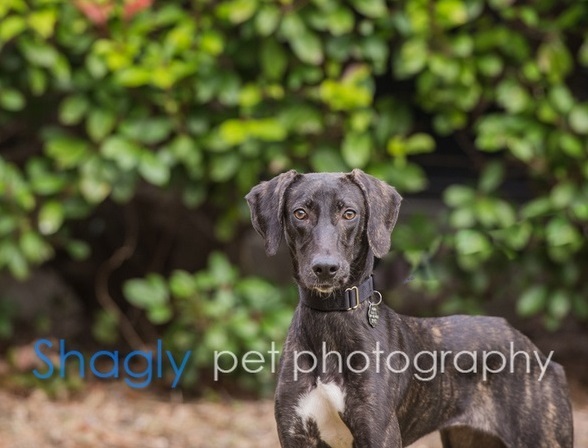 We did a DNA test on her, and Polly is a Greyhound / Chesapeake Bay Retriever mix. Polly's vision will be checked out by an ophthalmologist soon, it may not be 100%. Polly has passed an initial cat test and is living in a foster home with cats. Polly was examined by veterinary ophthalmologist, Dr. Robert Munger. She does have some vision loss, mostly in her left eye. It does not appear to be progressing, and may be the result of retinal scarring. Her vision is not expected to change from its current state, and it is not causing any problems at this time.